FlashFXP is one of the all-time favourite FTP clients among those 'in the know'. It sports a Windows-Explorer-like interface with support for 20 languages (French and English are included). 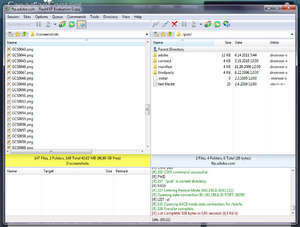 FlashFXP is optimized for speedy transfers and it certainly rivals the likes of FileZilla and CuteFTP in that category. For security reasons, you should also check out the FlashFXP download at LO4D.com which includes virus and malware tests. Additional screenshots of this application download may be available, too. 4.4 out of 5 based on 18 ratings. FlashFXP has a presence on social networks. FlashFXP download been highly rated by our users.